Our trek gets on gear with an overland journey to the small hilly town of Dunche, the main trading post of the area. From here we spend four days hiking up through this beautiful alpine valley to Kyangjin where we rest for a day for some high & wild exploration of the high mountains and glacial systems hereabouts. We then revert on the same path for three days before a journey to the sacred lakes of Gosaikunda, a major pilgrimage site for both Hindus and Buddhists. We cross the Laurebina pass (4600m) and drop into the lush Helambu region and get some upfront experiences of different cultural lifestyles on these huge mountains. We clamber through a rugged trail with dramatic views: to the west Himal chuli (7893m) Manaslu (8156mm) and Ganesh Himal (7406m). On a sunny day with bright blue skies, even the Annapurna range can be seen rising behind and to the north across the valley is the delightful Langtang Lirung. We hike pass a few huts in the high scenic area of Laurebina pass, cross a small ridge and behold our first views of the holy lakes. 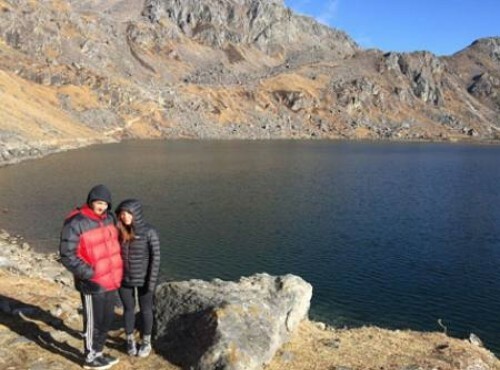 We reckon a dozen lakes can be found in the Gosainkunda Basin, the main three being Saraswatikunda, Bhairabkunda, and Gosainkunda. As legends would have it, Shiva created Gosainkunda when he pierced a glacier with his trident to obtain water to quench his thirst after having swallowed a poison that threatened to destroy the world. This trip wouldn't have been the same without Birendra's expertise and planning. Everything went smoothly and any request we had was taken care of by Birendra or his staff. Might I also add, this was very reasonably priced and once we were out hiking in the Lang Tang region the 24 hour attentiveness by our guide (shout out to Kamal!) and our porters made me feel it was worth every penny. My friends and I will be back to Nepal and will most definitely go through Birendra for out traveling needs! We had the most amazing trek with everything well organized by Birendra and our guide and porters. From the hotel and city tour to the comfortable tea houses the trek was perfect from start to finish. It was my fourth trek in Nepal and the best one yet. Highly recommend you use this company for trekking in Nepal for the BEST service and pricing and attention to detail. Our ten day trek in the Langtang region was incredible. Birendra made sure we were taken care of from the moment we stepped foot in Nepal till the moment we left. Our guide, Kamal, was amazing and made us feel at home our entire trek, finding us the best accommodations available each night and for each meal, and our porters were very friendly. We would all love to come back to Nepal to go on many more treks with Birendras team. In October 2014 I trekked in the Langtang region with Adventure Club Treks. I stayed with Birendra and his family which was great and he also arranged the trek for me. I was well looked after from being met at the airport to having my trip arranged and then safely returned to the airport for my journey home. It was my first visit to Nepal to go trekking and being in safe, trustworthy hands really helped me enjoy the experience. Thank you!